I came across this unusual plane at an antique store. It weighs over 10 pounds and appears to have been made of solid cast iron and steel. I assumed this was some sort of shoot board plane. There are no identifying marks on the plane or the cutters. 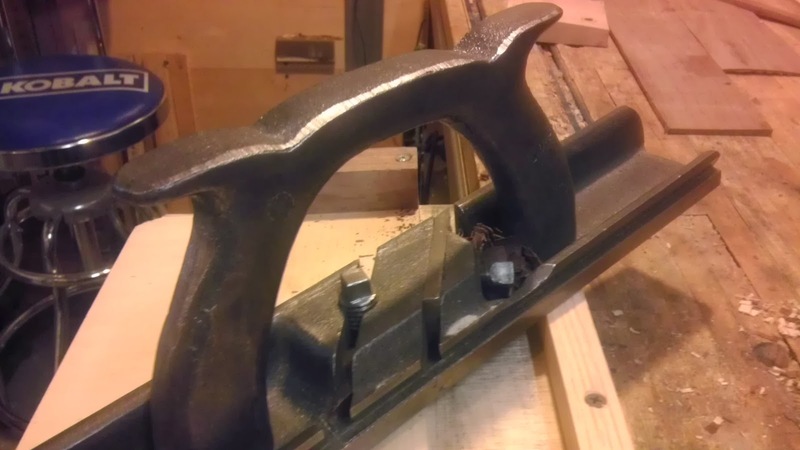 There are two cutters that cut from the side of the plane. 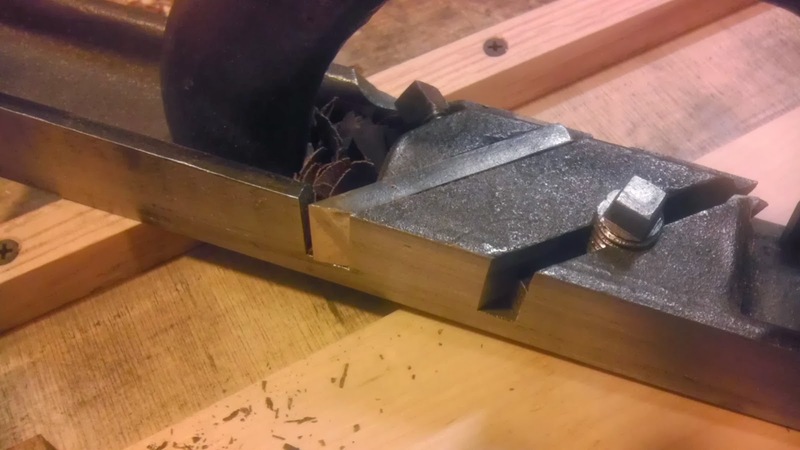 There is a straight cutter on one side and a 20° beveled cutter on the other side, the latter I thought was used somehow to make sliding dovetails. I thought this plane could work better than my existing planes for a shoot board, so I went ahead and bought it. If it did not work, it would make a nice replacement paperweight for my Stanley 55. 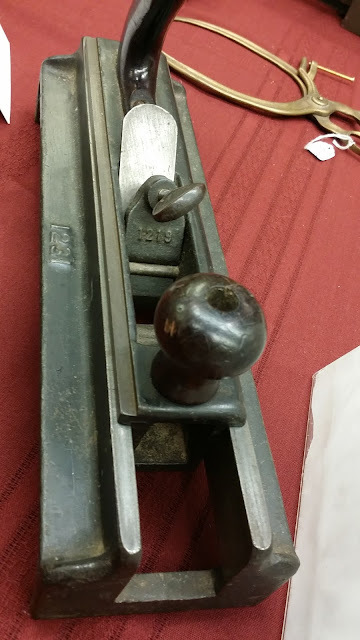 A knowledgeable contributor on the Sawmill Creek woodworking forum informed me that this plane, based on its massive weight, was used in the printing industry to trim the edges of the lead type and to also trim the sides of the wooden blocks that the type was set on. This piqued my interest further, so I looked up some information about the stereotype printing process. Not knowing anything much about the printing industry from a century ago, I found out a few facts about this plane and its use in the print making industry. There were two general types of planes used in the printmaking industry. The first is a shoot board plane as described above. The second is known as a type high plane. This plane is used to remove a sliver of material of the top surface of type to allow all pieces on the plate or galley to be completely flat . This plane was run over type that was mounted on the blocks once all the blocks were set onto a framed galley. The type high plane ran on an elevated platform. These planes were used in the blocking department for stereotype printing. The type high plane removes a sliver of wood from the top surface of the type so that the printing blocks are all level. 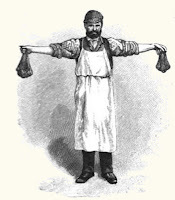 Stereotype printing is a method of forming a metal cast based on a wood engraving. A papier mâché mold is made from the wood engraving. Molten metal (lead, tin...) is poured into the mold. The mold is removed from the metal plate. 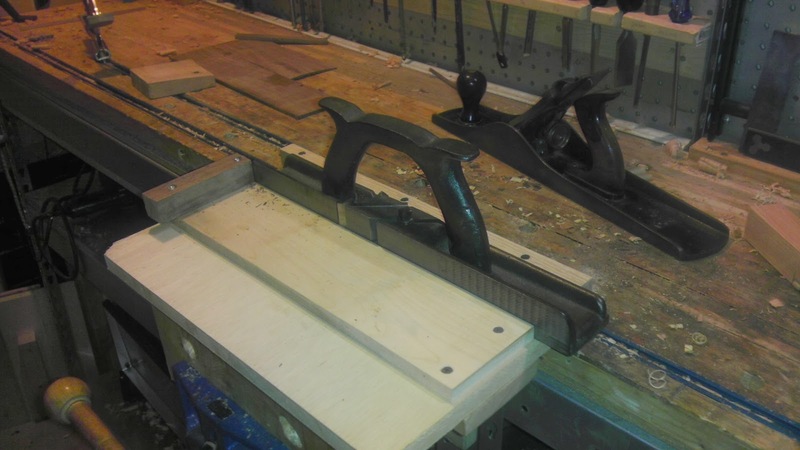 The plate is mounted with nails or screws (at a recessed area) to the end-grain of a wooden block, usually cherry, but sometimes mahogany or beech. The wood block with its metal plate is placed in a frame along with all the other blocks of text and pictures plus furniture (filler blocks recessed below the level of the type to create a space on the page). The blocks are than evened up on the sides or removing material from the top or bottom of the block to ensure that all is "type-high". For larger scale printing individual block letters with metal bases were used for the type, while images were still mounted to wood blocks. Sometimes,a combination of letters or common words were pre-formed to save time. 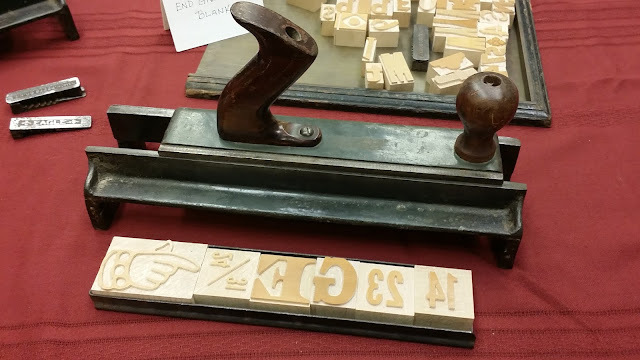 Some etymologists claim that the word, cliché, derives from these pre-made blocks of type, while others attribute the term to the sound made during the print making process. Stereotyping and cliché are sometimes used interchangeably in the printing industry. Regardless, the modern use of the words, cliché and stereotype, are based on this process. More information about stereotyping can found in Hatch and Stewart's Electrotyping and Stereotyping (1918). 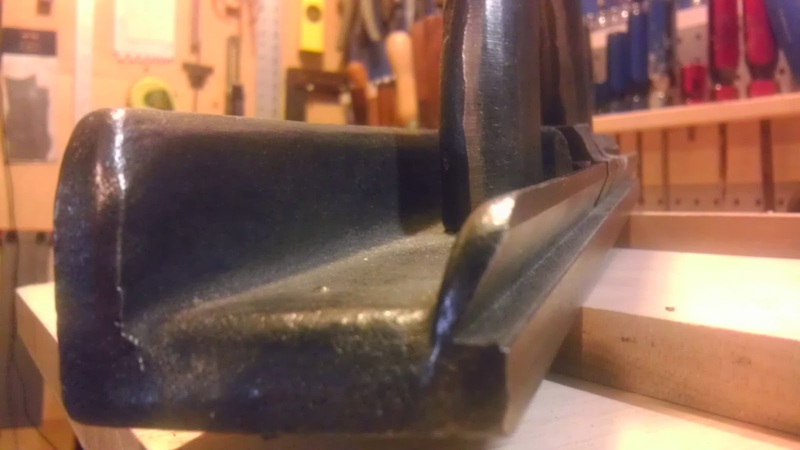 The mass, the orientation of the handle, and the ability to place it in between two boards to make a chute makes shooting an edge so much easier than using a traditional plane. A skewed blade is all that's missing. 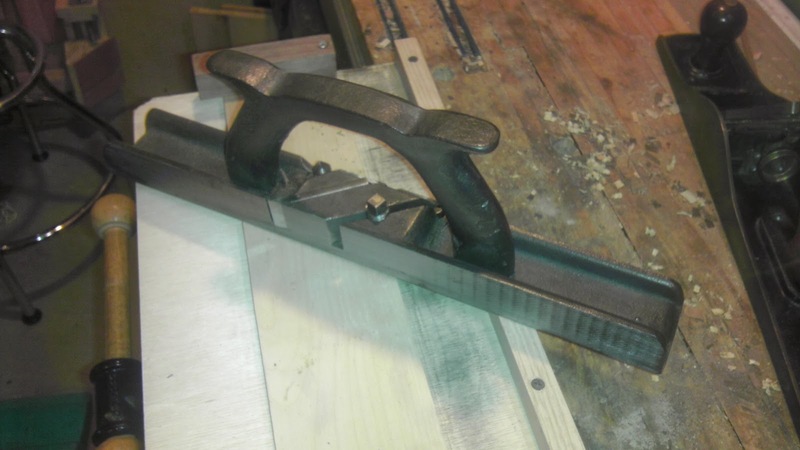 I have used this plane for a straight shooting board, a mitered shooting board and for a "donkey's ear" board (to create bevels along the length or width of the board), all of which are a "piece of cake". Sorry for the clichés. If I can figure out a use for the beveled side, I will post. Please leave a comment if you have any ideas.